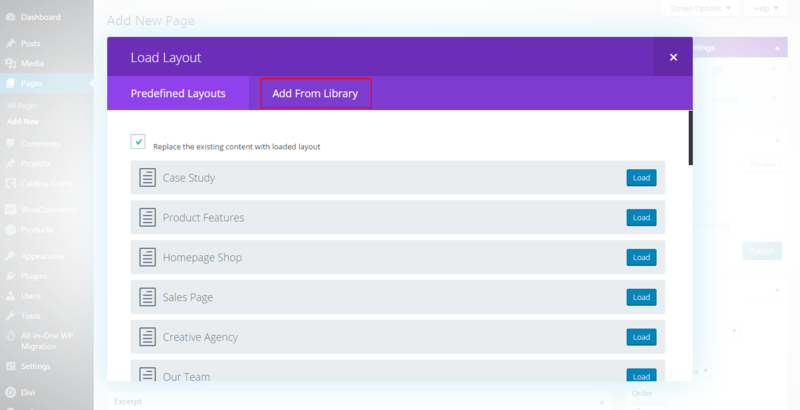 On the Divi Library, click the Import / Export button located at the top left corner of the right panel and modal window will open up. Select the tab “Import”. 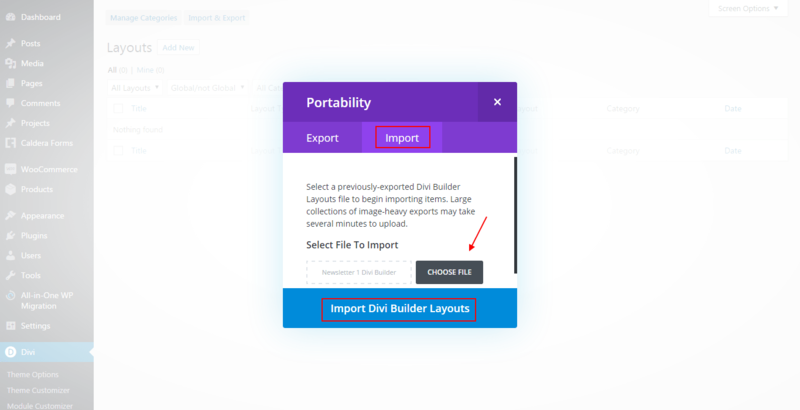 Now click on the Choose File button and select the Builder Layout .JSON file you downloaded, then click on the button “Import Divi Builder Layouts”. 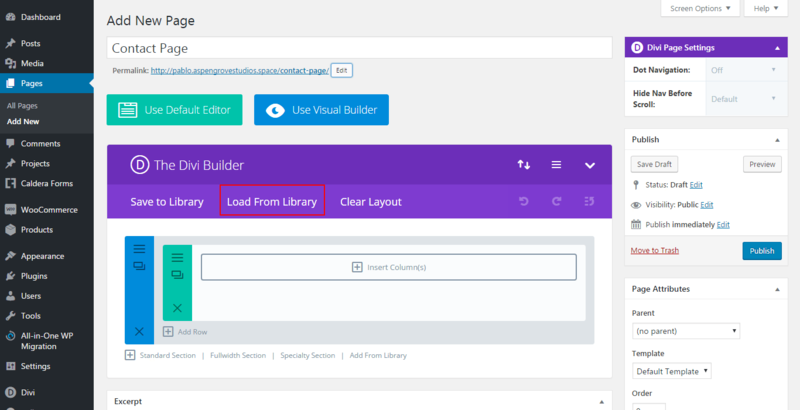 After a few seconds, your layout will be loaded and it should now appear in the list. 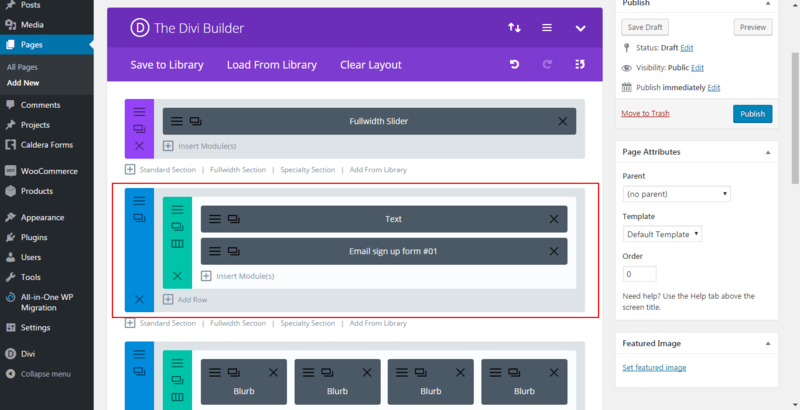 Now that we have added the layout and imported all other settings, it is time to install our form builder, Caldera Forms. 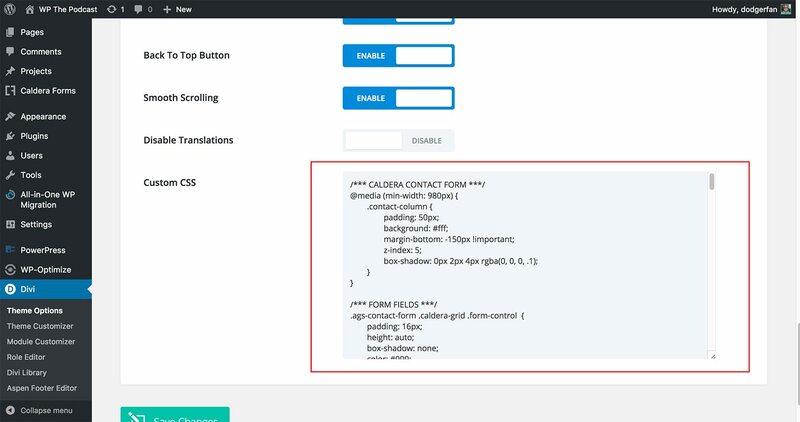 Caldera Forms, a responsive drag and drop form builder, is a free plugin in the WordPress repository that also offers a number of robust premium extensions. From your WordPress dashboard, select “ Plugins” and then “Add New” from the menu. 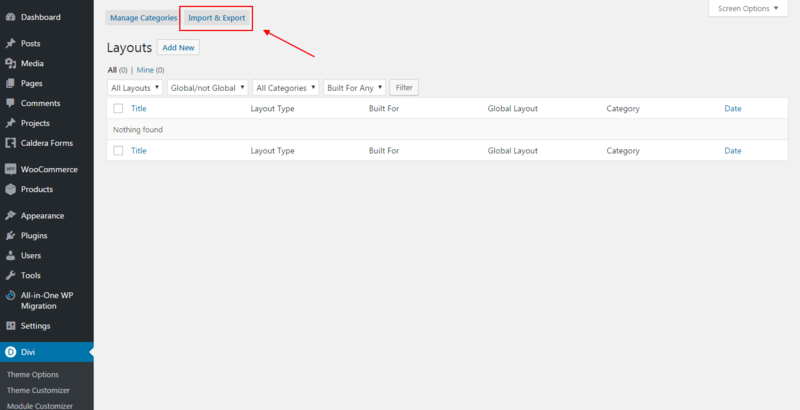 Once you are within the Caldera Dashboard, select the “ Import” button. You will see a modal appear then select “ Choose File” and locate the aptly named Caldera import JSON file(s) included with the download package. Name it whatever you choose and then hit the “Import Form” button. 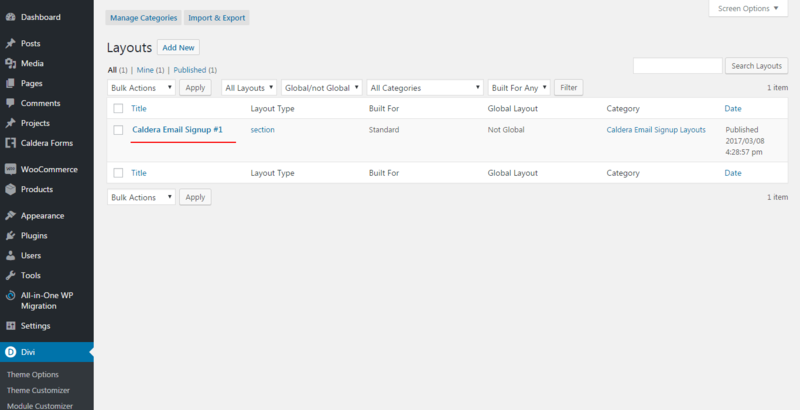 You will now see the form appear under the “ Layout” tab of the Caldera Form and can edit/ modify as needed. Save your form and continue to the next step. 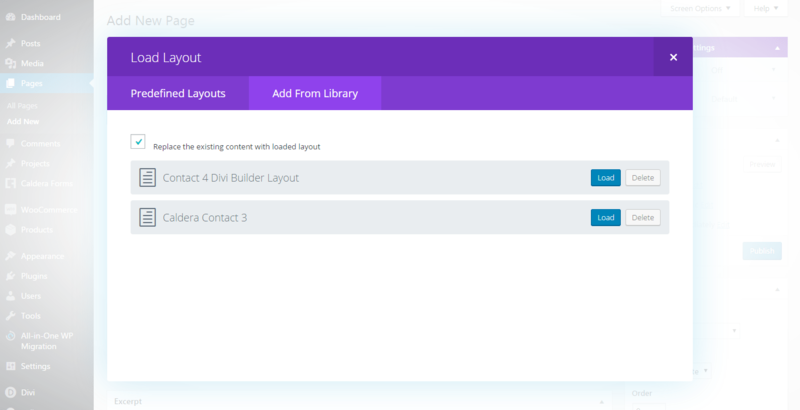 Now that you have the form imported and edited as needed, it is time to create your new AGS+Caldera powered Contact Page, or to add your new Section Layout to the page of your choice. Choose the Page Layout you downloaded and check the “Replace the existing content…” box if it suits your design. 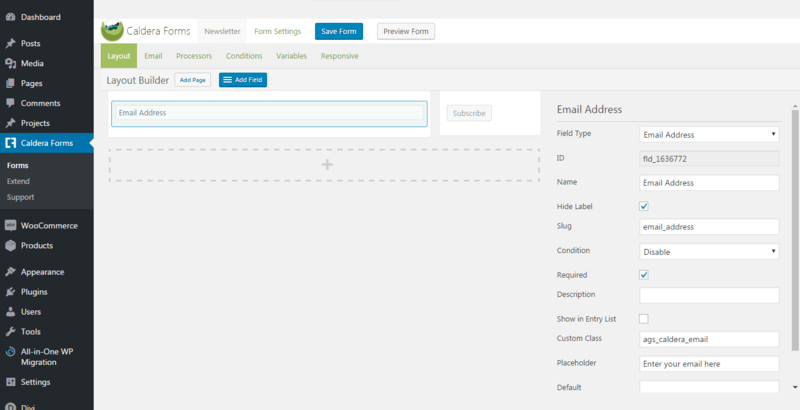 Publish your page, you now have a beautiful new contact page powered by Caldera Forms. Your shiny new section is now in the correct place. 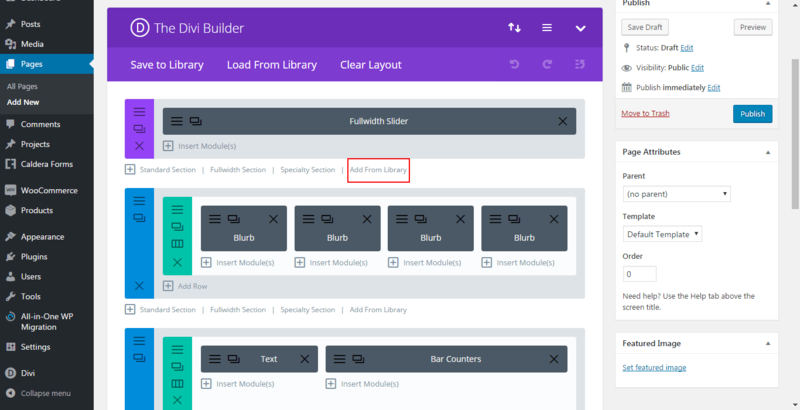 Edit the text modules at will and then click the Update/Publish button to save your changes. 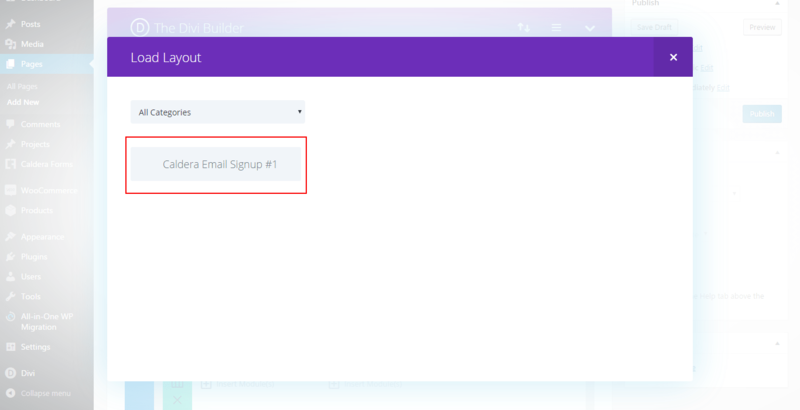 If the section is a subscription form, please note that in order to link to your desired email client (Mailchimp, Constant Contact, etc.) 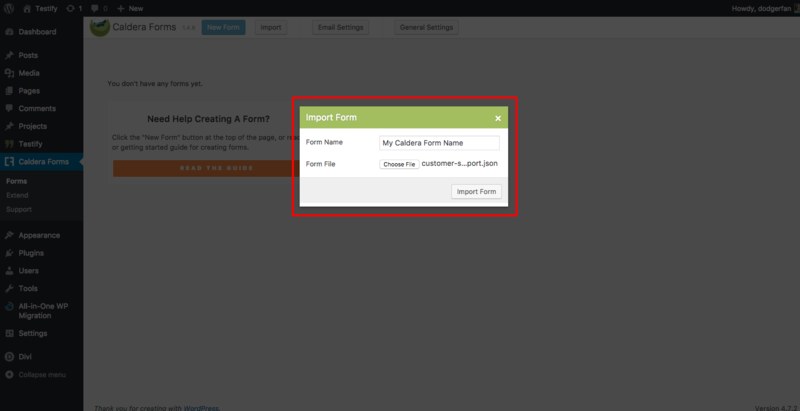 you will have to purchase the proper add-on from Caldera Forms and follow the necessary steps provided by them.